Meadow Orchard: How much is too much? I'm struggling with a dilemma. I am chafing at the bit to start another 'bit' of simple living. I'm torn - yoghurt? a sourdough starter? ginger beer? soap? - and I'm also keen to avoid biting off more than I can chew. I know that at the moment I feel on top of the 'simple strands' I'm already doing but I know how easily, how quickly it can become overwhelming. You only need to skip a few days for things to feel heavy again. I really, really want the changes I made last month to last - not just another month, but for good. I'm holding back on several fronts to try to make sure I am progressing slowly and sustainably, but I also don't want to limit myself overmuch when I'm feeling so enthused by my simple living journey, when it seems to be 'taking off' and I'm beginning to really feel the positive feedback loops. I'm considering several factors. 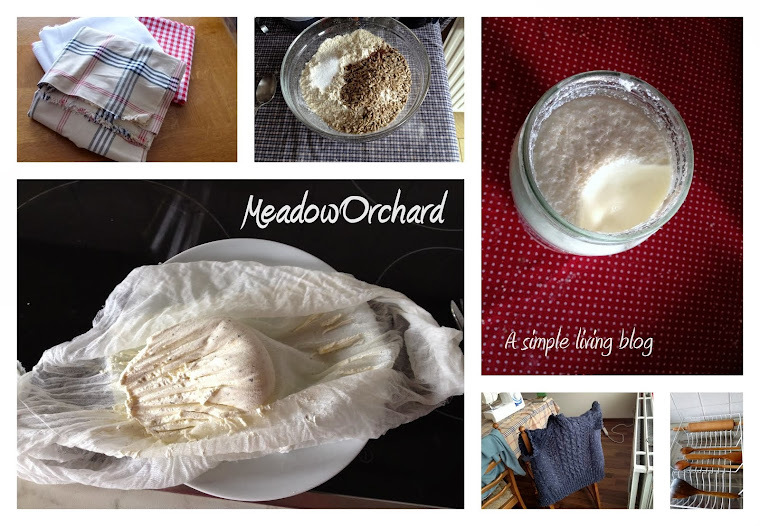 Yoghurt probably involves the smallest outlay - I have everything except the milk - and the most immediate reward, but I know that once I start making my own yoghurt, I'll want to carry on. Another set of tasks to be encorporated into my routine. I don't want to end up eating croissant from the supermarket for breakfast simply because I've run out of homemade yoghurt (yes it has happened before when I ran out of homemade cereal) - that would undo so much progress. Soap is another possibility. It's a much bigger challenge and I would need to buy most of the ingredients, but I could probably make 6-12 months' worth of soap in one batch. That's quite tempting. That's quite a result from an afternoon's work. I've been meaning to get around to trying to make ginger beer for some time, and I have pretty much everything I need - apart from a cloth to cover the jar with. I keep meaning to crochet a doily from leftover cotton yarn but it's another one of those things that I never get round to. Finally, I want to take on the next decluttering challenge. I've known what the next project is for a while. Last month I tackled my wardrobe head on - this month I want to tackle all the paperwork and stationery cluttering up cupboards and shelves. You wouldn't believe how much there is and how badly organised, and I'm determined to clear some space. Ah. Indecision. What next? Or is it still too soon after my last changes, should I focus on consolidating them? Please tell me you also face the same tricky decision. I'd vote for yoghurt. I've made it on and off before, but committed to only having homemade in January - if we ran out, we could only have milk on our muesli and that was enough encouragement to get on and make it! I read a lot of information about how to do it online and eventually found it was easier than it sounded. It only takes a few minutes to heat the milk, then it pretty much makes itself over a few hours. We eat quite a lot so I make 2l at a time as it lasts well in the fridge. Why not try it for a month or so - it will should become an easy habit in that time and you can move onto something new! Do whichever thing will give you the most pleasure, both in the doing and in the results. You are more likely to stick with something you enjoy! Yes been there - and I have attempted to do all of the at the same time and it doesn't work. I think get the soap out of the way because you will be done in about 2 hrs and then you have about 12 big cakes of soap to last you ages and it is not ongoing.I guess the other thing I had to learn was it really is okay to go and buy the croissant ...there are going to be days where it all falls apart - the lesson to remember to get back to it after the day of the croissant. All of the things you suggested are really fun things. As I said yesterday you are really popping. There's just no stopping you now. The me yoghurt was most important. At the time we had our own milk from our house cow and we needed to do something with all that milk so we made cheese and yoghurt. Now I just don't contemplate buying yoghurt. it's just too expensive and frankly just not good enough. So now I can buy good Biodynamic milk and make yoghurt for less than the cost of buying a jar from the shops. And it's something we eat everyday and we can make it with out having to purchase any thing except the milk (the cow is dry at the moment) But these decisions will probably concern you for a long time until you get closer to where you're going. Be gentle on yourself and only do that which doesn't burden you too much. Take care and happy simplifying, it really is a lot of fun when you feel in control of your life. 'Don't stop me now....' I'm certainly having a good time! I definitely hope the dilemma of 'what next' will carry on for a while - it's a nice one to have, and fun is definitely the word. Soap! Like you say, for an hour or so 'work' you'll get (in our house) 6 months worth of soap. Yoghurt is also quick, but you need to do it more often.